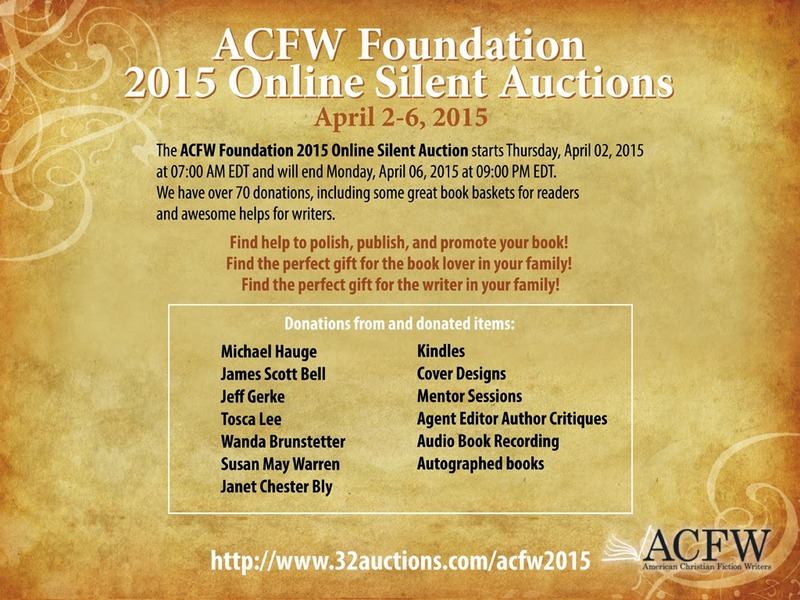 ACFW Foundation Online Silent Auction Starts Today! The ACFW Foundation Silent Auction starts on TODAY. There are some great books baskets for readers and awesome helps for writers. Several of your favorite authors -- Wanda Brunstetter, Tosca Lee, James Scott Bell, Dianna T. Benson, Lauraine Snelling -- have donated autographed books. Need an ebook cover? We have several that have been donated to the ACFW Foundation by talented designers like Ken Raney, Roseanna White, and Suzanne Wesley. Want to know what an editor or agent might think about your proposal? Several have graciously donated their time for a review of your first chapters and synopsis! How about like some advice from a published author? Would you like their input on your proposal? Multi-published, award-winning authors like Lauraine Snelling, DiAnn Mills, Susan Meissner, Colleen Coble, Stacy Adams Hawkins and many more have donated critiques and mentoring sessions. How about a Kindle? At least 3 baskets have a Kindle of some sort included. Need a manuscript edit? There are several of those as well. How about headshots at conference or early entry to the conference? We’ve got that as well as one conference registration. Now is the time for an audio recording of your book! All proceeds go to the ACFW Foundation Scholarship Fund. Thanks for coordinating this effort, Gina! I'm happy to do it, Carrie! You're sooo right, Anita, about it being a win-win. Lots of great donations too! I, sadly, can't bid on any because of conflict of interest.